An assessment of the quality of antibiotic prescription in Katutura health centre, Khomas region. Citation: Sheehama J, Van Zyl L, Hakuuria V. An assessment of the quality of antibiotic prescription in Katutura health centre, Khomas region. J Pharmacol Ther Res 2018;2(3):13-16. Background: Although the discovery of antibiotics revolutionized medicine and reduced mortality and morbidity rates, antibiotic resistance is a threat to these advances in medicine as infections are again rendered untreatable and causing a significant number of deaths worldwide. The Namibian Standard Treatment Guidelines which if followed, would standardize treatment of conditions in the country according to acceptable guidelines, preventing inappropriate and unnecessary prescriptions of medicines, serve as current prescription guidelines. The hypothesis of the researcher was that prescribers are frequently non-compliant to the Namibian Standard Treatment Guidelines. Methodology: Katutura Health Centre was the chosen representative facility and prescriptions were evaluated and compliance to the Namibian Standard Treatment Guidelines was assessed as well as the qualification of the prescriber, the diagnoses made and the antibiotics prescribed. Patient passports were screened at the dispensing points and details were recorded concerning antibiotic prescriptions. The data was evaluated for Namibian Standard Treatment Guidelines compliance and entered into EpiInfo version 7.1.1.14 and analysed. Results and Discussion: Prescribers were 51% compliant. Medical Officers wrote 66% of the prescriptions, Registered nurses 23% and Enrolled nurses 11%, with a compliance rate of 50%, 66% and 23% respectively. Respiratory and urogenital conditions were most prevalent and had poor compliance. Commonly prescribed antibiotics were Amoxicillin, Azithromycin and Metronidazole with respective rates of 46.25%, 23.08% and 13.29% for the three respectively. This correlates with a study done in Namibia, stating that the three most commonly indicated antibiotics in the NSTG were Cotrimoxazole, Amoxicillin and Azithromycin (CAA) at 49.3%. Antibiotic, Nosocomial infections, Syndrome, Gastroenteritis. Antibiotics were accidentally discovered by Professor Alexander Fleming on the 3rd of September 1928. This discovery revolutionized medicine as a bacterial infection would no longer be necessarily fatal but could be combated by using appropriate antibiotics . An antibiotic is a substance that is produced by or is derived from a microorganism which inhibits or destroys the growth of other microorganisms. They are used to treat infections that are caused by other organisms that are sensitive to them, usually fungi or bacteria . Ninety per cent of children died with bacterial meningitis before antibiotics and the majority of the children who survived had lasting severe disabilities ranging from mental retardation to deafness. Streptococcal throat infections were often fatal and ear infections could spread to the brain, having severe consequences . Stewardship of antibiotic prescription is very important to prevent this from happening. Multiple-drug resistant microbes also play a big role in nosocomial infections and are very dangerous in the intensive care unit (ICU) or among immune-compromised individuals . Antibiotics also damage the natural protective flora of the body and the natural flora may never completely recover from this . Antibiotic resistance is a global problem that has been detected in the United States of America, Australia, Asian countries such as China, European countries and African countries such as South Africa and Egypt . The antibiotic resistance problem for Namibia is mostly associated with Mycobacterium tuberculosis [7-9]. So far Namibia need a very big study project to assess the factors associated with drug resistance, especially the prescription of drugs and the buying of drugs from private trading pharmacies. The Namibia resistant strains organisms are Staphylococcus aureus, coagulase-negative Staphylococci, Streptococcus pneumonia, Gram-negative bacilli, Escherichia coli, Klebsiella and Enterobacter spp. Some drugs that microbes have become resistant to include: cloxacillin, erythromycin, co-trimoxazole, clindamycin, doxycycline, penicillin, ceftriaxone, fluoroquinolones, high-level gentamicin and streptomycin, ampicillin and ceftazidime. The inappropriate use of antibiotics in Namibia (overuse or wrongful prescription) has led to the emergence of various new antibiotic-resistant bacteria which is very dangerous and difficult to treat if they are nosocomial infections and in immunocompromised individuals . The study’s aim is to indicate the degree towards which the Namibian standard Treatment Guidelines are being adhered to with regards to antibiotic prescription at Katutura Health Centre in the Khomas region and this will contribute towards the health of Namibians by increasing awareness so that stewardship programs can be implemented in Namibia . A Research question of whether antibiotics are being rationally prescribed in Namibian clinics, specifically at Katutura Health Centre? The rational use of medicines, according to WHO (1985) is when Patients receive medications appropriate to their clinical needs, in doses that meet their own individual requirements, for an adequate period of time, and at the lowest cost to them and their community. The main objective of this study was to evaluate the quality and appropriateness of antibiotic prescription at Katutura Health Centre. A quantitative study is therefore appropriate to reach a conclusion about prescription practices at Katutura Health Centre. A descriptive study is a non-interventional type of study to identify trends and patterns in a situation but no causal linkages among its different elements. A cross-sectional study is taken in a single point in time. The data was collected from passports after the prescription was made to prevent the Hawthorn effect which is a type of reactivity in which individuals modify or improve an aspect of their behaviour in response to their awareness of being observed. The study area is one health centre, namely Katutura Health Centre (KHC) which located on the corner of Independence Avenue and Clemens Kapuuo Street, in the centre of Katutura, Windhoek. The Health Centre offers HIV counseling and testing as well as ARV treatment. It also offers DOTS TB treatment, ANC and family planning. KHC has limited staff with two senior registered nurses, twelve registered nurses, 21 enrolled nurses and two medical nurses. The study population is 20,000 communities of which patients of all ages visit KHC during the study period and are prescribed an antibiotic. All patient’s passports were be screened at the pharmacy once they have been seen by a healthcare provider in order to identify individuals who have received a prescription for antibiotics. Details for those cases were documented, such as the allocated patient number, the symptoms the patients presented with, their diagnosis and the treatment they have received. The data will at a later stage then be processed to establish whether the prescription of an antibiotic was appropriate for their condition, as indicated by the Namibian Standard Treatment Guidelines. Records in the form of health passports (prescription records) of patients in KHC were evaluated at the pharmacy after they finished their consultation, the diagnosis documented and its treatment for 100 patients. Once all the data has been collected, it was be evaluated to establish whether the appropriate antibiotics have been prescribed for the various conditions, according to the NSTG’s. The data was processed with reference to the Namibian Standard Treatment Guidelines and entered into EpiInfo version 7.1.1.14 and analysed by means of Microsoft Excel . No disclosure of the identities of neither the patients nor the health care workers. Authorization from the relevant authorities at the Ministry of Health and from the relevant authorities at the School of Medicine. The overall compliance to the NSTG’s for the antibiotic prescriptions was 51% (Figure 1). The compliance to the NSTG is poor as only half of the prescriptions are compliant. Compliance is determined by ensuring the appropriate antibiotic for the diagnosis, the correct dosage, frequency and duration. Poor compliance is to be expected as other studies done revealed similar compliance rates. A previous study at KSH revealed compliance to the NSTG’s for URTI’s was 47% . Another large nationwide study done evaluated NSTG compliance for all prescriptions and the strict criteria revealed a compliance of 26.2% and loose criteria 55.1% . Seeing as these studies were conducted 3 years ago, one would have hoped to have seen greater improvement and increased compliance which is not the case. Medical Officers wrote 66% of the prescriptions, Registered nurses 23% and Enrolled nurses 11%. The MO’s compliance rate was 50%, Registered nurses 60.87% and Enrolled Nurses 36.36% (Figure 2). The Medical Officers prescribed most frequently but the registered nurses were more compliant, though overall compliance was poor. There were 31 different diagnoses made, the most common being Acute Tonsillitis (18%) and Acute Bronchitis (17%), followed by urogenital causes such as Lower Abdominal Pain Syndrome (7%), Vaginal Discharge Syndrome (7%), Urinary Tract Infection (5%) and Urethral Discharge Syndrome (4%). Skin abscesses and Gastroenteritis was also common at 6% each (Figure 3). 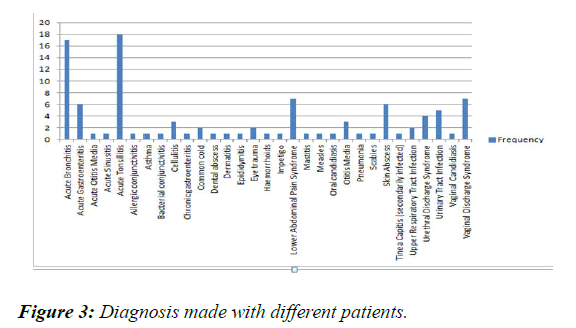 Figure 3: Diagnosis made with different patients. The most common system involved was the Urogenital (25%) and compliance was 44%. The Respiratory Conditions were second most (24%) with 58.33% compliance (Figure 4). ENT conditions were 22% with a 50% compliance rate. Dermatological conditions were 14% with a compliance rate of 64.29%. Trauma and Obstetrics and Gynaecology cases were 100% compliant, however they were only 2 and 1 cases respectively. There were 2 Oral and Dental Disorders which were both non-compliant. The antibiotics listed were all either prescribed as monotherapy or in combination with other antibiotics. The most commonly prescribed antibiotics were Amoxicillin, Azithromycin and Metronidazole with (Figure 5) respective rates of 23.08% and 13.29% for the last two . Other frequently prescribed antibiotics were Cefuroxime, Cefiximine, Penicillin VK and Ceftriaxone at 6.29%, 5.59%, 5.59% and 4.2% respectively. Figure 5: List of antibiotics and their effect. The quality of prescription if very much affected by the code of conduct employed by 95% of clinicians in individual private practices. This is due to lack of complementary services at their practices, they tend to prescribe broad spectrum antibiotic, and different types at once without laboratory investigation done. This is influencing the prescription of young healthcare provider, in public hospitals, despite the availability of clear guidelines on quality of prescription. Antibiotic resistance is a serious concern to be addressed by antimicrobial stewardship and the compliance of prescribers to well thought through guidelines guided by susceptibility patterns. There is much space for improvement in this area as NSTG compliance is inadequate and there are no reliable and representative susceptibility data. Three questions should be answered in order to comprehensively address antibiotic stewardship; why are prescribers not compliant to guidelines, what are the true susceptibility patterns in Namibia and are the NSTG’s appropriate? Oxford concise medical dictionary. Oxford University press. (2010). Ramsamy Y, Muckart DJ, Han KS. Microbiological surveillance and antimicrobial stewardship minimise the need for ultrabroad-spectrum combination therapy for treatment of nosocomial infections in a trauma intensive care unit: an audit of an evidence-based empiric antimicrobial policy. S Afr Med J. 2013;103(6):371-6. El Kholy A. Antimicrobial resistance in Cairo, Egypt 1999-2000: a survey of five hospitals. J Antimicrob Chemother. 2003;51(3):625-30. Blaser M. Antibiotic overuse: Stop the killing of beneficial bacteria. Natur. 2011;476(7361):393-4. IDSA. Promoting Antimicrobial Stewardship in Human Medicine. 2015. Ampath. Using Antibiotics Wisely. The Namibian Sun. 2012. Kibuule D, Mubita M, Naikaku E, et al. An analysis of policies for cotrimoxazole, amoxicillin and azithromycin use in Namibia’s public sector: Findings and therapeutic implications. Int J Clin Pract. 2017;71(2): e12918.